The Macarthur hospitality industry is in good hands. Last month students of Thomas Redall High were in the limelight for their culinary efforts. 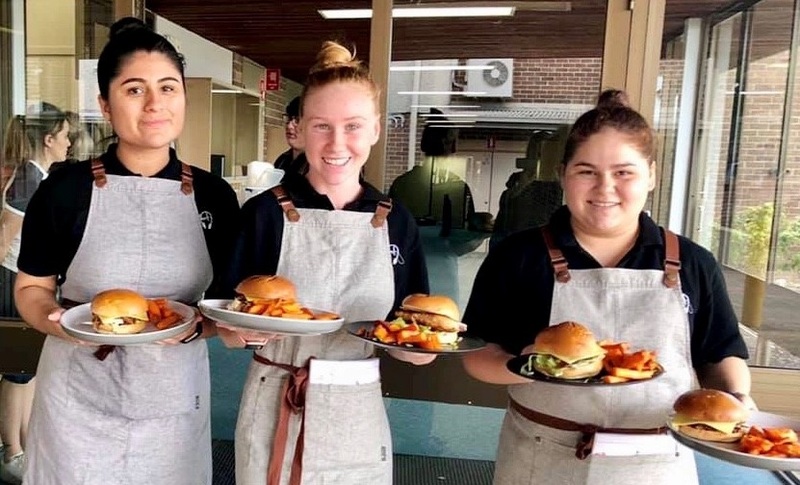 Now John Therry High Year 12 hospitality students have cooked up a storm for 70 teachers and senior students as part of their mandatory work placement. They prepped, cooked and served delicious chicken and lamb burgers followed by mouth-watering desserts of chocolate brownies and sticky date puddings. The long lunch program was designed by MWLP work placement manager – and former local chef – Michael Everett. Also taking part as advisers to the participating students were senior hospitality executives Graham Krueger from Wests Leagues Club, Darren Lees from Hospitality Training Network (HTN) and Peter Sheppard from Campbelltown Catholic Club. The advisory team also included James Fairbanks from HTN, as well as former student Courtney Abela from Airport Rydges, who was responsible for plating the amazing desserts. “This level of expertise providing mentoring opportunities to engage students in the industry was beyond the expectations of ordinary work placement,’’ said Angela Cascarino, John Therry’s VET coordinator. Some of the student stand outs included Joe Huynh, who is in Year 12 and was very impressive as maitre d’ for the lunch. Not only was he responsible for the invitations and name tags, Joe capably ran front of house at John Therry. Joe, who has a passion for hospitality, attended the MWLP Jobs for Youth night and work placement at Campbelltown Catholic Club recently. He was so impressive he has been offered an apprenticeship commencing early 2020. “Today has been great and I can’t wait to start my apprenticeship,” Joe said. The man behind the event, Michael Everett, gets to have the final say: “Today was awesome. Connecting local students to industry representatives is what our job is all about, but to work with them as well is so good,’’ he said.